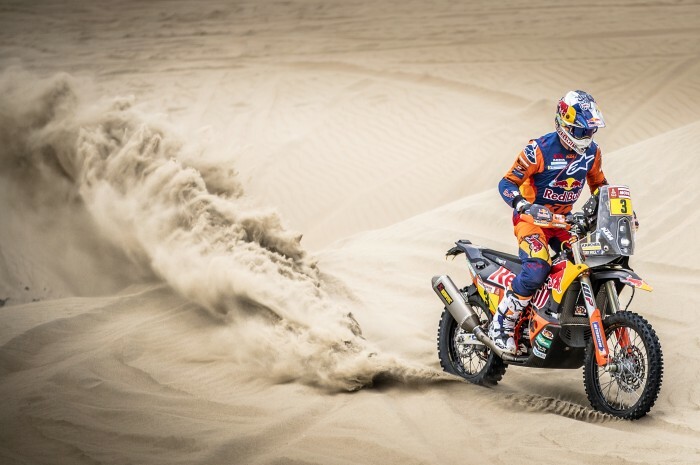 Former Dakar winner Toby Price fought through the pain of a damaged wrist on the 225-mile stage eight to take the overall lead with a podium as Ricky Brabec was forced out with a blown engine. Price said he was at his maximum on the Red Bull KTM and just had to shut off the pain from his wrist. “Today, I knew it had to count. That was my maximum today, so any more than that, well… I can’t do any more. My wrist is on fire now, so it’s been a long stage, 360 km, but we’ve made it here to the finish and there’s just two more to go – this is a good thing,” said Price.